This paper describes the fabrication of polycrystalline magnesium aluminate spinel (MgAl2O4) by microwave sintering and hot pressing and the investigation of its dielectric properties in the millimeter-wave and terahertz frequency range. 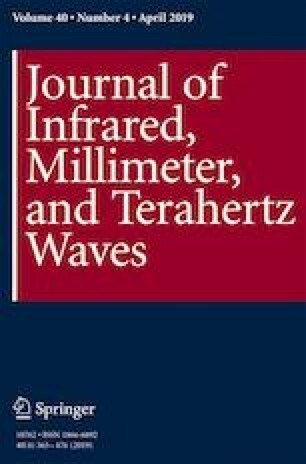 The dielectric properties were studied in the frequency range 50–300 GHz using a spectrometer based on an open Fabry–Perot resonator with a high quality factor and in the range 0.6–3.3 THz using the time-domain spectroscopy method. The terahertz radiation was generated as a result of air breakdown using two-color laser pulses with carrier wavelengths of 800 and 400 nm. The dielectric characteristics of MgAl2O4 ceramics obtained from high-purity nanosized powders by microwave sintering and by hot pressing are compared. The refractive index of the materials varies from 2.85 to 2.95, and the dielectric loss tangent increases from 1.5 × 10−4 to 1.5 × 10−2 within the frequency range 0.05–3.3 THz. The possible use of magnesium aluminate spinel for millimeter-wave and terahertz applications is discussed. The study of the microwave sintering of MgAl2O4 ceramics was supported by Russian Foundation for Basic Research, grant No. 16-08-00736. The study of the sub-terahertz and terahertz dielectric properties was supported by the Russian Foundation for Basic Research and the Government of the Nizhny Novgorod region, grant No. 18-42-520015.